Israeli Twitter responds to Benjamin Netanyahu's speech before Congress. Israeli journalists and public policy voices spent Tuesday live-tweeting Benjamin Netanyahu’s fiery speech in front of Congress, which argued against a nuclear deal with Iran. While opinion was for the most part divided neatly along ideological lines, there was some interesting analysis of how the speech might successfully achieve its two main apparent goals of derailing the Obama administration’s current nuclear negotiations with Iran and getting Netanyahu re-elected. 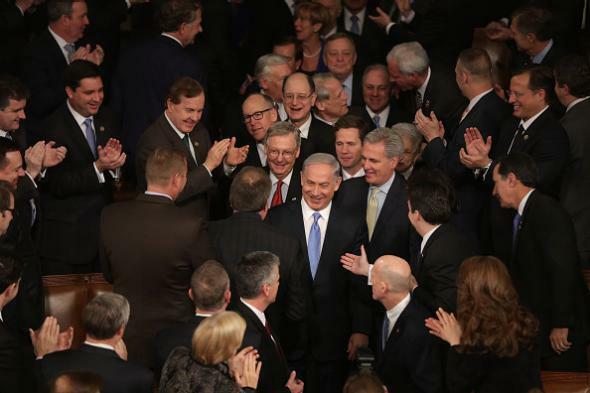 Netanyahu defenders and critics alike were quick to note that the boycott of the speech by more than 50 Democratic members of Congress didn’t have much of a visual impact in a raucous full house. Bibi never had such a warm welcome in the Knesset. A big topic of conversation was Netanyahu’s shout-out to the Purim holiday, which starts Wednesday. Key figures in the Purim narrative are a princess named Esther who saved the Jewish people from a genocidal tyrant named Haman. Big difference between Haman and Khamanei according to Bibi - Haman couldn't tweet, but Khamanei has Twitter. Soon a game started of counting the standing ovations Congress gave Netanyahu, though there was debate about the final number. There seemed to be a general consensus, though, supporting the critiques of the Iranian regime broadly. Very Good Speech, now lets see if history sees it as a turning point or a low point. Likud campaign now has 13 days to use clips of #NetanyahuSpeech to make sure he gets a record-breaking 4th invitation to address Congress. Feeling deflated, as I've been waiting months 2 watch a horror movie that didn't deliver the goods. No surprising denouement in #BibiSpeech. I guess we’ll be able to tell more in two weeks when Israeli voters actually go to the polls.